https://mysonginthenight.com/songwriting/ buy now The Patribots — Patrick Henry High School’s competitive robotics team — returned home from Las Vegas on Sunday, March 26, tired and inspired from three rigorous days of robotics competition. Their return marked the end of a season of firsts for the team — a season that was almost derailed far too early. click here The team competed in the 2018 For Inspiration and Recognition of Science and Technology (FIRST) Robotics POWER UP Championships as defending regional champions. The team worked hard in 2018 with hopes of capturing a return bid to the Houston World Championships, one of high school robotics’ most competitive technological challenges. buy now On Feb. 20, the Patribots completed their robot they named “The Milkman.” Teams were given only six intense weeks to design, build, program, and test a robot to compete in the game. The Patribots battled March 8–10 at the Del Mar Fairgrounds Stadium to defend their title. Their best efforts and preparation, however, were thwarted on the second day, when a collision with an opposing robot shattered the radio on the robot, plaguing the team’s communication system for the remainder of the competition. The accident broke more than a radio, it shattered the team’s hopes of making it into the finals as they fell in the rankings from 18th to 55th out of the 66-team field. A broken robot could be fixed, and so, too, could the team’s broken hopes. The team knew that “The Milkman” was better than its 55th place finish. The loss challenged the team to work together to find a way to compete in a second regional. Student members, on their own, contacted FIRST Regional Directors throughout the United States to secure an invitation. They were invited to compete in Las Vegas. On March 21, the Patribots traveled to Las Vegas. Due to the short, two-week turn around and conflicting commitments, only a mentor, a parent, and five students traveled to Las Vegas with the robot. A second mentor and student arrived the first day of practice. Many San Diego teams were in Las Vegas, including the 2018 San Diego Regional Chairman’s Award-winning team, The W.A.R. Lords, from Francis Parker High School and the Super NURDs from San Pasqual High School in Escondido. After starting the day 0-5, the Patribots won their first match to begin a nine-win streak. In its seventh match of the day, the Patribots stacked up a score of 516, just five points less than the tournament high score of 521. Their final qualification match of the day would test the team’s skills. They had a face off with the undefeated, and No. 1-ranked, W.A.R. Lords. Allied with the 26th- and 29th-ranked teams, the 35th-ranked Patribots turned to playing defense against the efficient scoring of the W.A.R. Lords. When the buzzer sounded, the Patribots extended their winning streak to three, handing the No. 1 seed its first loss of the tournament 252 to 91. The Patribots piled up points to win their final four qualification matches. At the end of the qualification rounds, the Patribots ranked 11th out of the 44-team field. A season goal was within the team’s reach: becoming an alliance captain. The previous year, the team was the second team picked in alliance selections. 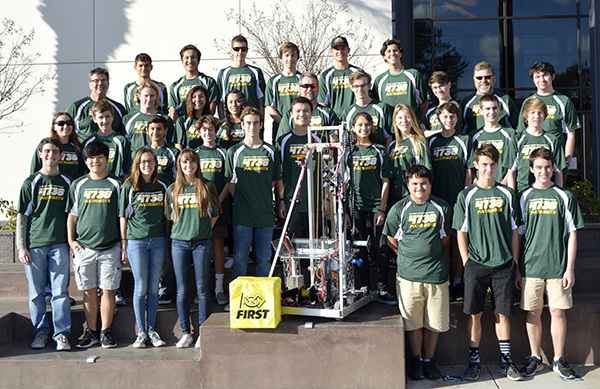 This year, the team ended up as the 8th-seeded alliance captain. This would mean a showdown with the No. 1-seeded alliance. In the quarterfinals, the underdog Patribots allied with 19th-ranked Team Element from Van Nuys and 34th-ranked MindCraft from Fresno, California. It would be a long shot for the alliance to unseat Francis Parker and its alliance of the 2nd-ranked Super NURDs from Escondido and the 15th-ranked Gravediggers from Sandy Utah. The Patribot alliance should have been buried. In the second quarterfinal match, the alliances traded control of the scale until the Patribots piled three consecutive milk crates to control the game, after the Super NURDs robot fell to the carpet. Defeating the No. 1 alliance by a score of 397-351, the Patribots advanced to the semifinals as the comeback and Cinderella story of the tournament. The Patribots lost in the semifinals to the No. 4 alliance. But, they proved to themselves that they are ready to compete as a top team in FRC and work to inspire youth in the community. In addition to qualifying for the Las Vegas finals, the Patribots were acknowledged for their computer programming. Sami Rida and the marketing team created an 8-bit computer game based on the FIRST POWER UP theme that was awarded the Best Computer Programming by CRiSP Softwares. Student builders, electricians, and programmers completed the Patribots’ 150-pound “Milkman” with time to test and drive this season. The team built a practice clone to prepare for the competition and to train drivers. Communication was this year’s team goal for the Patribots. FIRST encourages teams to grow as young professionals with each design challenge. This year, the team was dedicated to learning by design, led by design lead Jacob Lerner. The team did math as they designed, prototyped, and modified the robot. The team’s 37 student members and nine adult mentors worked to make this a successful season by turning schematic drawings into working parts. In addition to a robot, the team built a new pit and storage system that was revealed at the 2018 competition. A constant hum of drills, saws, grinders, and mills fill the new Engineering Workshop. The team is really excited about the growth of the Engineering Program at PHHS. New engineering labs and a workshop have made the team more productive as evidenced by students working the machines with skill and precision. The bright lights in the workshop that burn past 9 p.m. each evening during build season symbolize the bright future at Patrick Henry Engineering. There is a growing emphasis on Science, Technology, Engineering and Mathematics (STEM) education throughout the Patrick Henry Cluster, and future students will enjoy the bright new facilities. It takes a community to build a robot. The team is proud to represent Qualcomm, TSI, Northrop Grumman, The National Defense Education Program, All Star Glass, Strategy Builders, General Atomics, the PHHS Engineering Program, PHHS Foundation, and Natural Networks. The marketing team helps the Patribots get the word out about STEM. Sponsor decals enhance the physical appearance of the robot, the robot pits, and the team swag, which include buttons, wristbands, T-shirts and more. The work of the marketing teams creates an exciting, sporting atmosphere in the team pits that rivals NASCAR. The Patribots are always looking for additional community support; if you are interested in being a mentor or a sponsor, please contact Adria Van Loan-Polselli at avanloan@sandi.net. — Harlod Mumford is Patribots coach and Adria Van Loan-Polselli is an engineering teacher at Patrick Henry High School.